ShopEverything home for every budget. ShopStylish designs to discover daily. ShopThe best of modern, priced for real life. Rated 4.7 out of 5 stars.1564 total votes. Take 12 months to pay! Get the Wayfair Credit Card 5. Looking for a boho-chic addition to your living room seating arrangement? Look no further than this sofa! Crafted from solid wood, it stands atop thin legs and features a track-arm design wrapped in polyester velvet upholstery for a textured appearance, relying on button-tufted details for even more visual appeal. Web suspension offers you and your guests a comfortable place to sit, whether you’re chatting over coffee or enjoying a movie marathon. At Mistana, Pacific coast–inspired boho furniture and decor celebrate the individuality of your home, where beautiful and bold designs share a unique story. Start your journey here. 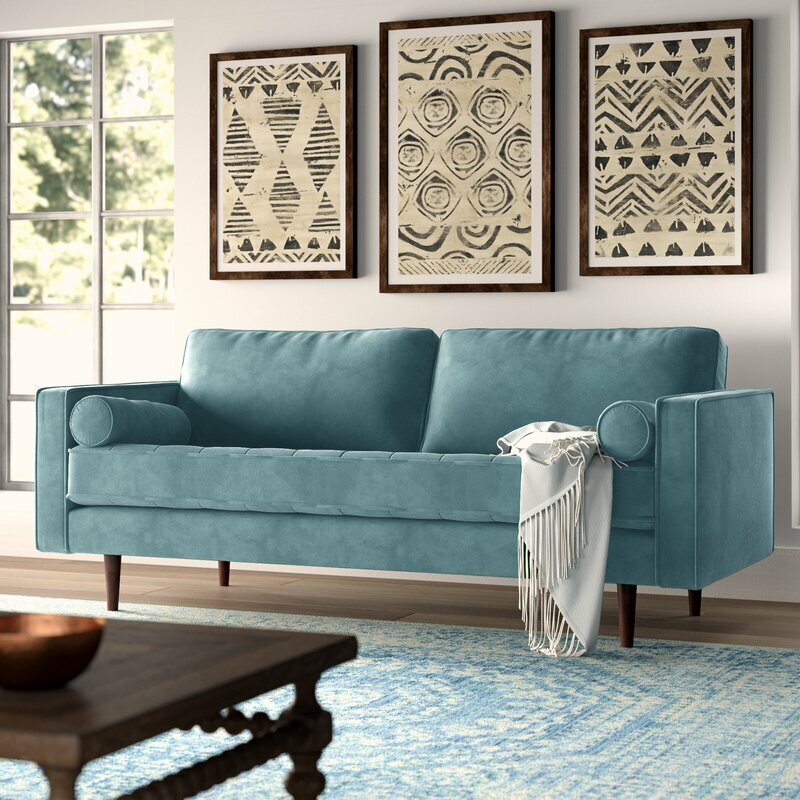 When you buy a Mistana Derry Sofa online from Wayfair, we make it as easy as possible for you to find out when your product will be delivered. Read customer reviews and common Questions and Answers for Mistana Part #: MTNA3897 on this page. If you have any questions about your purchase or any other product for sale, our customer service representatives are available to help. Whether you just want to buy a Mistana Derry Sofa or shop for your entire home, Wayfair has a zillion things home. Love it, Would really probably work in any kind of environment as long as you want your friends to think you are stylish and cool. Perfect napping couch, seriously increased the quality of my naps by 70-75%. It looks so nice that I won't even let others sit on it. When I have friends over I sit right in the middle and make the rest of the people sit cross-legged on the floor like children. It has such great personality, that sometimes I feel like I should give it a name. I am obsessed with this couch! It's exactly what I was looking for - it's extremely comfortable, the material is soft and luxurious, and it's long enough for a 6'6'' man to lay down with his legs stretched out. I love the mid-century vibe and the price was mind-blowingly cheap. I had been eyeing the Article Sven couch and this is SUCH a good dupe! Very, very pleased. First time ordering furniture from wayfair and I must say I'm impressed. The delivery was on time and when I opened the package it was exactly as advetised. Firm and green. All I had to do was screw the legs on and wallah! This couch was exactly what I needed to add the pop of color in my studio apartment. We purchased this couch in sapphire and it is absolutely gorgeous! I had admired the Sven couch from Article but was happy to come across this much more affordable option. The couch is very roomy with very plush fabric and comfortable cushions. The color is a bit brighter than pictured but beautiful! Excellent couch. Very sturdy and supportive. Assemble was incredibly easy and the fabric is insanely soft. Highly recommend this couch. Rated 4 out of 5 stars. The blue is more of a bright "superman" blue than a dark navy. Very comfortable and a great size for a taller person to lounge. The depth of the seat and the length of the cushion are great. Overall a good sofa and a great value. This couch is LOVELY and feels amazing! It is so soft and feels great to the touch. Seat is very firm and feels well made. I could not be happier with this purchase. Delivery was easy and the item arrived before I expected it from Wayfair's delivery partner. We waited many months for this color, Emerald, to come back in stock. It was well worth the wait and Wayfair customer service was excellent. I am so happy! Obsessed with my new couch! Great quality, firm but comfortable. It took a little long to arrive but it actually got here 2 weeks earlier than it was supposed to. The delivery team was excellent. Very happy with my purchase. Honestly, in the home photos I couldn't tell if I'd like it or if the material would be cheap, esp since the price was so reasonable. When it arrived, it was much nicer and more plush and comfortable and sturdy than I could have imagined! Extremely easy to screw on the legs and get in place too. I tried to include photos, the pile really photographs weird, but I highly recommend it - so glad I made the purchase. This sofa has exceeded my expectations. I had been contemplating a sofa five times the price and can't tell the difference with this sofa. It is a beautiful velvet and quite comfy. I have even considered it being suitable as comfy place to fall asleep because the sitting cushion is one flat piece that is the perfect firmness. Rated 4 out of 5 stars.33 total votes. The Stehouse Sofa brings comfort and style to any living area. Rated 4 out of 5 stars.29 total votes. Short on space? No problem! Here to help, this petite loveseat brings trendy looks home without stealing valuable real estate. Crafted from solid and manufactured wood, this piece measures 27'' H x 52'' W x 26'' D. It features gently curved arms studded with sleek nailhead trim up top, while dark brown wood legs round out the look below. The pair of back cushions removes, making general upkeep (and finding runaway TV remotes) less of a headache. Rated 4 out of 5 stars.2 total votes. This is their Loveseat which combines comfort with fashion. With extra thickly upholstered cushions for maximum comfort, the removable back cushion allows you to adjust it to a desired position and angle at will. Rated 4 out of 5 stars.360 total votes. Worthy of their names, it’s hard not to adore loveseats. Whether they’re tacked on to a seating group or used as a primary piece in small-scale living rooms, they add a new look to your layout without stealing valuable floorspace. Take this one for example: Crafted from a metal frame, it features foam-filled upholstery and removable cushions for fuss-free upkeep. Plus, it easily converts into a sleeper - making it a must-have for impromptu visits from the in-laws, friends who stayed a little too late after your dinner party, or kid’s sleepovers. Rated 5 out of 5 stars.1 total votes. This sofa is a beautiful statement piece for your home. It has straight tapered walnut legs to add a retro touch. Legs attract attention to the rigid lines, specifically designed to make this piece pop in any room. Rated 4 out of 5 stars.34 total votes. This leather settee is great for any living room space. Perfect for smaller living areas and homes, this settee features smooth leather and cushion-like seats. Enjoy one in your home. The sofa can be assembled without the legs. Rated 5 out of 5 stars.50 total votes. A modern design with a glamorous side, this streamlined sofa brings a taste of what’s trending as it offers seating for three. Crafted with a solid wood frame, this piece is filled with memory foam, cushioned with synthetic fiber, and upholstered with velvet fabric for a tastefully textured look. A gold finish outfits the metal bracket feet for a sleek touch, while two included toss pillows make this seat even more inviting. Assembly is required. Rated 5 out of 5 stars.9 total votes. Marrying mid-century modern and glamorous elements, this streamlined sofa sets an inviting foundation in your living room layout. Founded atop tapered wooden legs in a warm brown stain, this clean-lined design is crafted with a solid eucalyptus frame, foam fill, and polyester-blend fabric in a solid hue for understated appeal. Two included bolster pillows round out the look and provide a bit of cushioning as you kick back. Partial assembly is required. Rated 4 out of 5 stars.375 total votes. Understated design meets mid-century style to give this wood fame sofa a distinctive look for rounding out your living ensemble. Its button-tufted details add a refined touch to any space while its streamlined silhouette and square arms fuse together for mod appeal. Crafted from a solid wood frame, this piece is wrapped in 100% polyester upholstery, and features seats crafted from sinuous springs and foam filling. Measuring 35.5'' H x 84.5'' W x 35.5'' D, this sofa requires a 40'' W minimum door width. Overall Width - Side to Side - Arms 0.5"
Rated 4 out of 5 stars.334 total votes. Defined by neutral-toned upholstery, sloped arms, and a clean-lined silhouette, this eye-catching sofa adds a contemporary touch to your living room or parlor ensemble.